Everyone knows that in Brussels you visit the Grote Markt (Grand Place), look for the Manneke Pis, and maybe stop by the Atomium, but if you have more than a day, here are a few things you really should try. First and foremost, enjoy the food! Belgium is well-known for chocolates (believe me, the more expensive ones are usually worth it; we loved some of the artisanal chocolateries in the center of town, but we also liked to get pralines and truffles from our local bakery–and don’t miss the pastries, cakes, pies, and other delicacies). Fresh bread, rolls called ‘pistolets,’ and chocoladebroodjes (pain au chocolat) can be found at any corner bakery, and there are usually several to choose from within walking distance. We bought ours at Allemeersch a little boulangerie off the Place Jourdan, since that was near our apartments. There was also an open air market on the weekends, where we could get good cheese, butter, strawberries, etc. And of course, the grocery store supplied us with strong coffee, jam, and Nutella. Breakfasts on our little veranda were a joy when the weather was nice, which we were lucky to have for the first week or so before it turned cold and rainy again for awhile. You never know in Belgium! 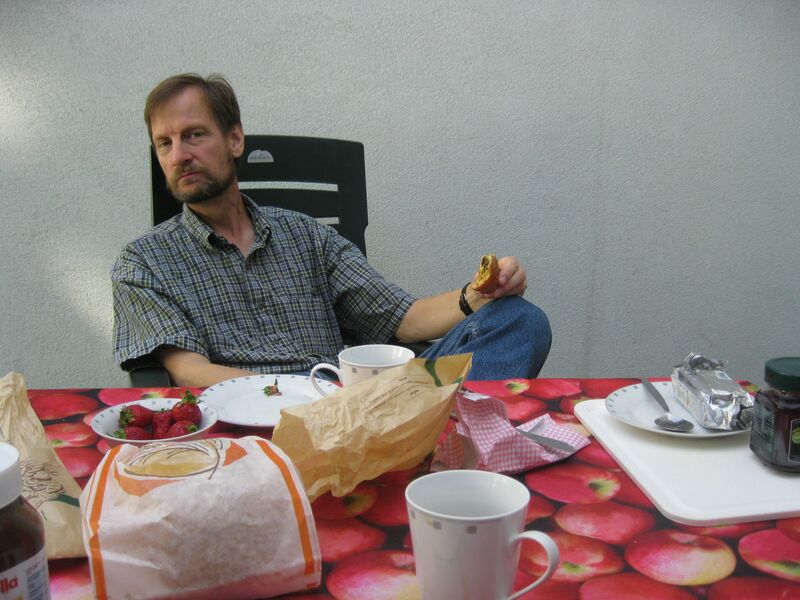 But most of our time in June was warm and nice, and we were glad to have jackets and umbrellas for the other days. Of course, the other food you must try in Brussels are the frites. 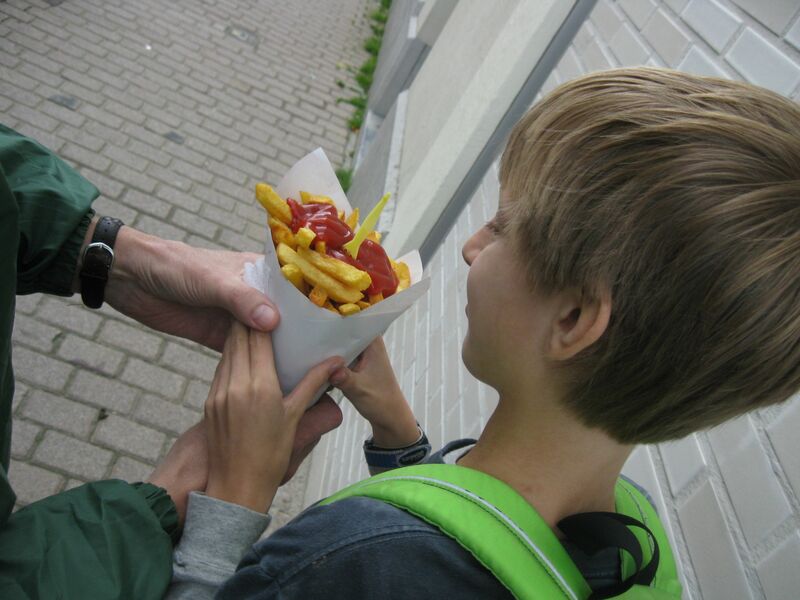 Fries eaten from a paper cone on the street (or take them home) with spicy mayonnaise sauce are hard to beat, especially while they’re hot. And the food is cheap, even at restaurants, if you get away from the touristy areas. We loved the fries on Place Flagey, though Antoine’s on Place Jourdan was also excellent and may have a little more old-fashioned ambiance, especially if you take your fries and sit at one of the many cafes that allow you to bring them in and buy a drink. 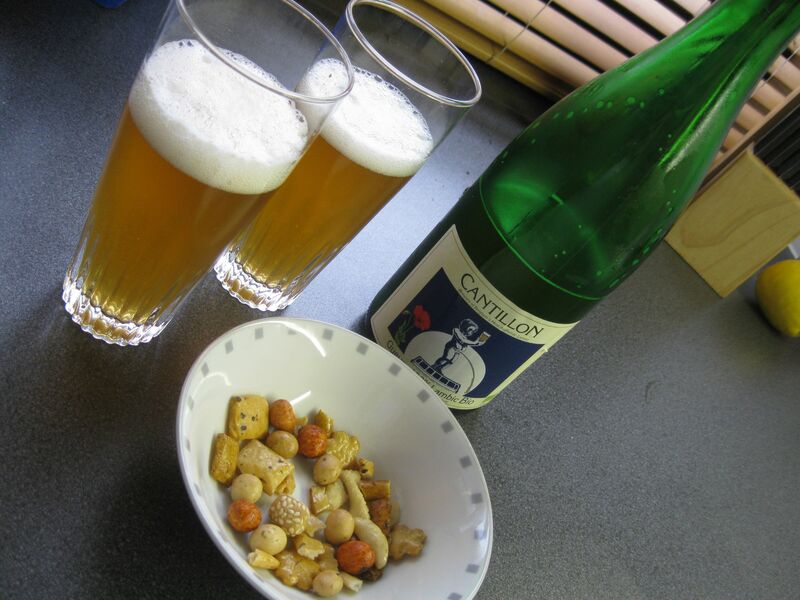 Once you’ve had your breakfast or lunch, though, you may be hankering for some Belgian beer. In Brussels, the traditional brew is Lambiek, a beer that is traditionally brewed using a natural fermentation process. 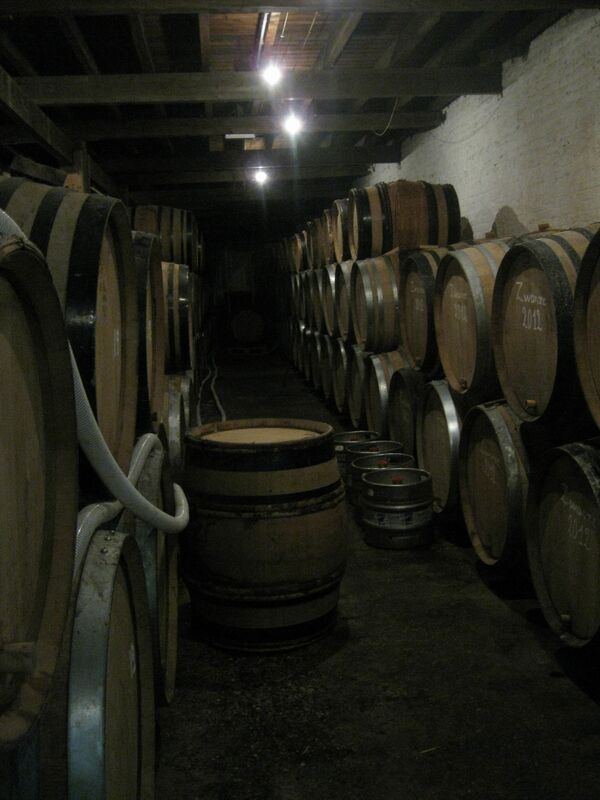 We took our group of students to the Cantillon Brewery, which is operated as a museum. 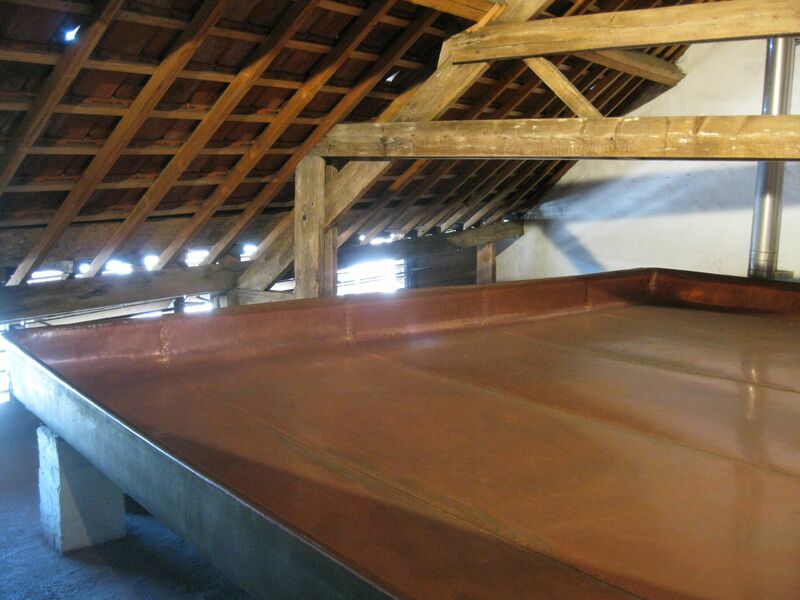 There we could see the shallow vats, where the beer is exposed to the bacteria in the air (found only in this valley of Brabant) that causes the fermentation to start, giving this beer a sour taste like sourdough bread. We also learned how they age the beer in oak barrels and then mix differently aged lambieks to make Geuze or mix lambiek with whole fruit to create Kriek (cherry), Frambois (raspberry), Pêche (peach), or other flavored beers that are quite tart, yet very refreshing. Lambieks are an acquired taste, and not all of our students liked them, but some who weren’t beer drinkers normally found they liked these flavors more than other beers they had sampled. If you don’t have time for a brewery tour, you can still get traditional lambiek beers at several cafés in the city center, including brown cafés like Toon, A la Becasse, and Au Bon Vieux Temps. You might walk right by these, since they are literally a hole in the wall that leads down a narrow alleyway to the bar behind a store front.